Brilliant shine for your car’s paintwork, glass, rubber, trim and chrome. Easy to apply in minutes – no hard rubbing or polishing needed. Locks in shine for up to a year. 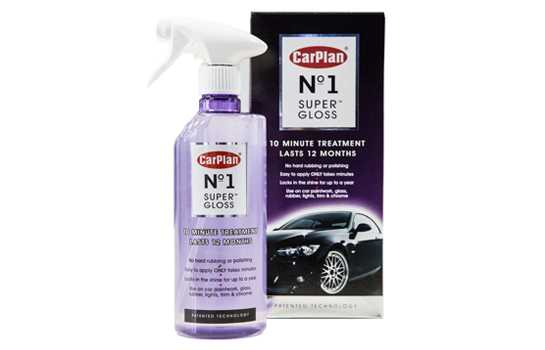 CarPlan Nº1 Super Gloss Spray provides a brilliant shine for your car’s paintwork, glass, lights, bumpers and trim. Simply wash your car as normal then apply the Super Gloss Spray and wipe off. It takes just 10 minutes to cover an average sized car but the results last up to 12 months. Watch the water bead off time after time. Nº1 Super Gloss is an innovative formula that uses patented technology to provide long lasting protection and durability whilst maintaining and enhancing a showroom shine. Dust and dirt simply cannot stick. A bottle of Nº1 Super Gloss will provide shine and protection for up to 9 applications on small sized vehicles, 7 applications on medium sized vehicles and approximately 5 applications on 4x4s, motorhomes and caravans. This product is amazingly easy to apply and the results are outstanding. The way the rain beads off once applied is fantastic. £10 at Halfords, £8 Wilko’s! Buy it you won’t be disappointed. Brilliant stuff! To test how this product performs on an unpolished surface I didn’t polish the roof of my car (it’s a tall 4×4 so I don’t see any scratches or swirls anyway!). The CarPlan sealant was just as easy to apply and has still added a lovely deep shine. So far the water beading on the roof seems very tight and the water sheeting ability seems as strong as the rest of the car. Going by this i’d say most normal users of this product (after a quick result) will be very impressed and certainly satisfied. Well done CarPlan. Awesome and easy to use. Makes my car ping in the sunlight with minimal effort. Cannot recommend this highly enough.